Mr Patrick Green QC for the claimants is on his feet. Nothing in this thread is a direct quote unless it is in direct quotes. PG talking about that in terms of NTC switchover and evidence from Brian Trotter about the reality of that contractual situation as played out. Some SPMRs were not allowed to give 3 months notice - they had to stay on until a replacement could be found. I’ve already understood more of what they’ve said in the last 15 minutes than I did all day yesterday. They are now discussing employment case law (Autocleanse) with regards to providing a personal service. This is another massive thing in this case as personal service has a bearing on whether you are a worker, agent or employee. PG and judge notes the SPMC makes no distinction between individuals and companies who become Subpostmasters. J "well you argue that and you aregue that the Autocleanse process should be applied”. PG and Judge also agreeing that PG isn’t arguing it IS an employment relationship - as, for instance, SPMs invest money in the relationship - but it is very close and that Autcleanse should apply. PG raises 2 issues on this. 2 x occasions when PO employees during audit have entered information into Horizon without SPM knowledge or permission and when Post Office encourages as policy the entering of fake transactions to balance stock. Both those are raised in the written closing submission. … happened in real life. Or may not be. That last quote from PG was a direct quote. You can have that. He was speaking very slowly. The lunchtime baguette I bought from Pret is quite aromatic. I am going to close my bag so I stop getting distracted. They are talking about the “accept now” “settle centrally” and process of disputing a discrepancy. PO accept that this happens but that the dispute process is robust enough to stop discrepancies which are not the fault of the SPM from being put on them. It is about the investigation function when it comes to a loss and how much of the onus is on the SPM to help the PO work out where a loss may have come from. PG discussing the tools available to the PO to ivnestigate a loss and how they’re not “wildly keen” to use some because for instance requesting ARQ data from Fujitsu costs them £450. PG and judge still going through transcript of AvdB’s xe. Now talking about the Credence database was created by PO to support non-compliance and fraud detection within branches. POLSAP tracking trends of unusual behaviour. I think the point PG is trying to make is that the PO does have some quite sophisticated tools that should or could allow it to intervene to help SPMRs before it gets to a suspension/termination situation. PG “The pure ability to do something or not do it…. might be relevant.” The Post Office doesn’t… on the basis its very expensive. Doesn’t mean they couldn’t do it." PG goes back to AvdB’s evidence about the PO’s knowledge of what is going on in a branch. PG we’re on to the Post Office’s generic defence which I have but haven’t got round to uploading yet. PG quotes from it: "A TC notification sent by PO to a branch is a proposal not an instruction and it does not take effect unless accepted by the SPM concerned." PG “the accept now button has to be pressed, then you get the three options, make good by cash, make good by cheque and settle centrally"
PG says there is a deliberate choice by the PO to exclude the existence of a dispute button in relation to TC or discrepancy - it was discussed in 2008 and rejected. PG notes any sum under £150 cannot be disputed AT ALL. He notes helpline tells people that TCs will come down the line so they settle and don’t dispute (even if they disagree) and he notes that with surpluses the situation appears even more confused. When I said “accepted dispute” in the last tweet, I meant a dispute over a discrepancy which the PO has accepted is in dispute (raised via a call to the helpline). PG says this is not the case that the Post Office has been making to date. PG starts giving examples of how the Post Office’s argument seems to have changed over the course of the trial about settling centrally. This will be an interesting thing to look at it in the transcripts as it is quite a lengthy discussion now going on. They are reading out parts of Mr Cavender’s xe of Lead Claimant Mr Abdulla. Mr Cavender objecting. Wants Mr green to explain exactly where his case is different because he doesn’t believe it is. J says it’s PG’s point to make and he is sure Mr Cavender can make his point in due course. We are done with TCs and now onto discrepancies. 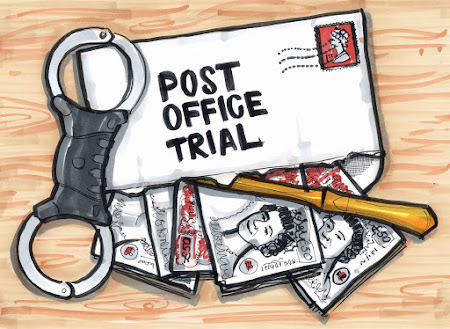 PG QC has been making the case that the Post Office’s position on what is the correct procedure for dealing with discrepancies has evolved with the trial. He has quoted at length from Mr Cavender’s xe of Mohammad Sabir to illustrate this. The judge has not allowed Mr Cavender to respond, but I suspect he is looking forward to the opportunity to respond tomorrow alongside stating the Post Office’s case. PG Claiming re audits "Factually what’s now being said is just not what happened on the ground at the time." Moves on to Liz Stockdale (lead claimant)’s evidence. We have hit an issue of disclosure re evidence re Liz Stockdale. Judge has asked for all references in Opus (the court online viewer and transcribing software) to solicitors with specific regard to Liz Stockdale’s case. A frisson just went through court. Rather than cack-handedly trying to explain what just happened (as there is a possibility I have missed a detail and I don’t want to attract the ire of my learned friends) I’ll leave this for tonight when I get the transcript. We’ve moved onto variances in the SPMC (subpostmaster’s contract) and the NTC (network transformation contract). There are many contracts governing the various different types of PO branches. The SPMC is based on a 1994 drafting and the NTC was introduced this decade. J - The PO says the nature of the liability is the same. It might not be. Do you contend the versions are different? could arise from matters other than looking after the cash and stock. Just to be clear - @johnsweeneyroar wasn’t just mentioned in court! I should have made those square brackets in the last tweet… sorry. PG notes that the Post Office is arguing in its generic defence that the proper construction of 12.12 would put the legal burden for proving losses on the Postmaster and the postmaster alone. PG says that they re-iterated this point “bedded it in” for the Common Issues trial. He is making the point that in the light of what has been heard in the trial the PO’s argument (outlined in 93 and 94 of generic defence and reiterated) re burden of proof doesn’t make sense. mentions Mr Cavender is on his feet suggesting PG has been misreading the Post Office’s position on this. PG Might this be a convenient moment? J How are you doing for time? PG “We’re in good shape my Lord. PG “Though it rather depends on the list of questions you have for me. J Oh it’s very modest…. mentions …. PG I’m grateful. The indulgence is that we’ve been given an extra 5 mins for lunch. Which I’ve spent typing that exchange up. PG now going over the moment when Angela van den Bogerd was “mistaken” in her assertion she was coming to a piece of evidence cold. Her WS for the forthcoming trial in March was shown to her and she remembered she wasn’t coming to it cold. The PO QC has used this in his closing submission as a “stark” example of the claimants refusal to respect the structure of this group litigation. PG points out that in her own WS Angela vd Bogerd admits the point is not relevant to Horizon. …point if one at all. He said the point that was put to him was one of AvdB's credibility and he may have to decide on that. PG accepts and moves on. PG now pointing out areas of the PO’s closing submission which criticise PG for asking about reasonable expectations and pointing out that PO QC did exactly the same thing. J Good - next point. Though that last one was barely a point at all. J we know you think it is wrong. It’s pretty simpl to work out whether it’s right or wrong. I just want to know why you are drawing it to my attention. J in terms of criticism of you. PG the post office is being unfair because we are right and therefore it is not unfair to point that out. We got to the NFSP. PO contends in closing submission that the Claimants have launched an attack on the NFSP which is unjustified. J says but whatever point you make about the NFSP can only relate to the NTC as that is the context in which it was being raised. Not the SPMC. Onto PO view of the Lead Claimants evidence made at the back of the PO written closing. PG says the evidence on which this is made is unreliable. J understood. Remind me your case on Mr Bates contract of formation would be when? In relation to Mrs Pam Stubbs: 583 "Mrs Stubbs understood she would be bound by (and very probably physically signed her agreement to be bound by) the terms of the SPMC…." J it’s wrong to say there’s no mention of the letter, because there is. Your view on her contract formation? J noting that it was the date she remembered them taking her banking details so she could be paid, also that she got paid PAYE - was taxed at source like an employee and it took her quite a while to sort it out. They move on to 589 "Moreover, even Mr Sabir’s evidence that it was possible he had not received a copy of the contract did not stand up…." “… His apparently weak grasp of English in oral evidence (which was notable for its variability) should not be confused with a lack of intelligence. It was implausible that, as a commercial man making a significant investment…"
PG says there is a difference to the PO view of his ability to remember what happened to him than the claimants. … to the Post Office’s? PG yes my Lord. In fact I’d like you to do that with all the witnesses. J I thought you might. J now has a list of questions for PG. First one is a typo in an xe of Mr Beal which suggests the opposite to the line of questioning. Agree it is a typo that PG has missed. J isn’t sure it’ll be important but wanted to check. J knows that both in opening and through xe of AvdB you put different internal PO docs that demonstrated what could be said to be internal knowledge or discussion of Horizon causing problems, throwing up discrepanvies etc. J I don’t think there’s a single list anywhere of these problems? J letters to/from Mrs Stockdale? J put them in part two of that list. Just what they are…. dates… No submissions. DC we say my Lord you should be careful as to whether more weight should be given to Horizon or Breach… we say no findings of fact or comment on anything that relates to those trials. DC so when it comes to findings you shouldn’t make any comment until it comes to those particular trials. J well it might be better to deal with that tomorrow. J says your case makes an inference on the reliability of Horizon. I’m not going to ignore that whole part of the case. From the discussion the judge and the PO QC are having I have a feeling tomorrow, when the PO QC stands up, it is going to be a lot like Monday. … any findings he might make in relation to that evidence might impact [prejudge, maybe?] on the upcoming trials. Is that right? Judge rises. That is the end of today. Today was far better than yesterday and there were some very interesting moments. I’ll get you the report as soon as I am able.